If you had passed this way three hundred and fifty years ago you would not have stayed long ! Forest, moor-land, maybe a few wattle huts, and the ruins of a pre-Reformation Church, called `the Chapel of Saint Malachi of Cromlyn." "Cromlyn," by the way, was the ancient place-name, and means "the crooked glen." Into this unpropitious scene came the Hills. Moyses Hill, a native of Devon, arrived in Ireland in 1573, as an officer in the army of the Earl of Essex, sent by Elizabeth I to subdue the rebellious O'Neill. When the wars were over, he remained, holding important offices under the Crown. and at the same time identifying himself with the Irish by marrying Alice MacDonnell, sister of Sorley Boy MacDonnell, of Dunluce. After residence at various places, notably at Larne and Hillhall, his family moved to Cromlyn and made it the centre of extensive lands that had passed into his hands from Bryan McRory Magennes in 1611. In process of time Moyses' descendants became numbered amongst the richest, most powerful-and most benevolent-landowners in Ireland. 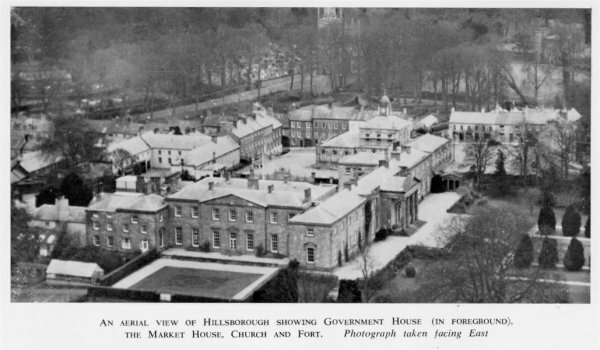 From them Hillsborough derives its name, and all that is notable in it to-day is a reminder of their wealth and taste. In 1663, by charter of Charles II, it became a Corporate Borough, having a sovereign, twelve burgesses, and freemen, with a recorder and sergeant at mace. The Corporation ceased to exist in 1832, but the "Corporation Pew" and ancient mace may still be seen in the Parish Church. The Borough returned two Members to the Irish Parliament until the Act of Union in 1800. THE MASSIVE TOWER, housing a ring of eight bells, cast by Rudhall of Gloucester in 1772, and an electrically operated carillon. The graceful spire rises to a height of 210 feet from the ground, and, when floodlit, it can be seen from miles around. On the face of the tower two date stones with the Hill and Downshire arms, mark the episodes in the building's story. 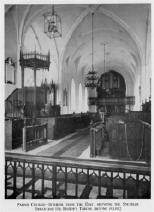 THE HIGH PEWS, designed for warmth before the introduction of church heating, and made of locally grown oak. THE ORGAN in the West Gallery, the work of John Snetzler, the most famous organ builder of the eighteenth century. THE SMALL ORGAN in the South Transept, built by England, a pupil of Snetzler, in 1795. It originally stood in the hall of the Castle, and is associated with the name of Lady Arthur Hill, composer of "In the Gloaming." 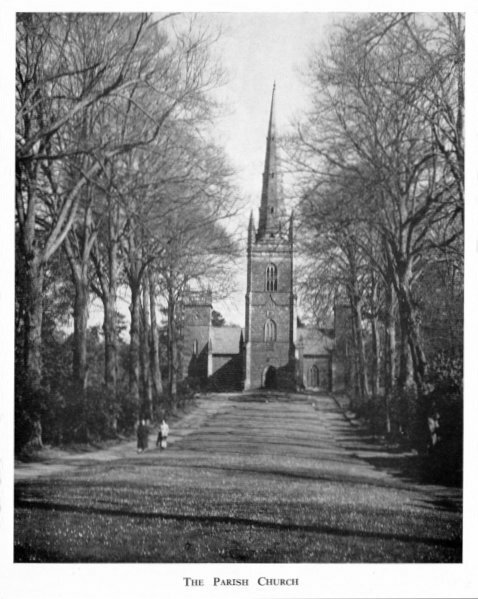 In the realms of Church music there is a great local tradition, dating back to Michael Thompson, Doctor of Music, who was organist 1773-1796, and involving the names of William Harty, who held the office 1878-1918, and Sir Hamilton Harty, his famous son. THE LESLIE MEMORIAL-the "naked baby"-on the north wall of the Nave. It is the work of Nollekens. THE IRISH MARBLE PAVEMENT in the Sanctuary, a memorial to the Fourth Marquis, given by his son, Lord Arthur Hill, in 1898. THE SANCTUARY PANELLING, which is Lebanon Cedar. THE EAST WINDOW, the only glass in Ireland made after a design by Sir Joshua Reynolds (1723-1792), the first President of the Royal Academy. THE GOVERNOR'S PEW, in the North (left) Transept, on the right at the top of the steps. It is here that members of the Royal Family sit when attending Divine Worship. THE STATE CHAIR, in the North Transept, was part of the furnishings of the Chapel Royal in Dublin Castle. It was removed for safe keeping by the Dean and Chapter of Christ Church Cathedral when the building was taken over by the Eire Government for use by the Roman Catholic soldiers of the Irish Army. It was loaned to the Select Vestry by the Dean and Chapter in 1952 "in order that it may be used in the Church in the Parish of Hillsborough wherein the Representative of the Queen of England is wont to worship." THE CORPORATION PEW, in the South (right) Transept, directly opposite the Governor's Pew, and beside the Pulpit. THE BISHOP'S THRONE, nearby, reminder of the fact that in 1770 Down Cathedral lay in ruins, and it was Wills Hill's intention that his Parish Church might become the Diocesan Cathedral. THE BRONZE LIGHT PENDANTS, designed by Sir Albert Richardson, K.C.V.O., Past President of the Royal Academy, and presented by Mr. and Mrs. E. T. Green, of Eglantine, to mark the completion of restoration, carried out 1951-1956 at a cost of ?14,000. Other matters of interest will be found recorded in the Baptistry. 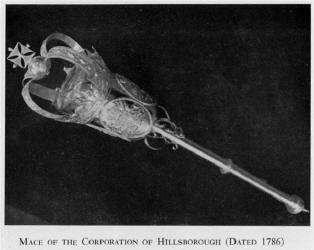 The Church Plate and the Mace of the Corporation may be seen by arrangement with the Rector. THE BIRD BATH, which marks the burial-place of the ashes of Sir Hamilton Harty (1879-1941). It is the work of Rosamund Praeger. THE LYCH GATE, erected by public subscription as a memorial to Henry Boyd (1857-1925), who was the local Dispensary Doctor for over forty years. THE GRAVE OF RICHARD MANT, immediately to the left of the Lych Gate, in the Churchyard. He was Bishop of Down and Connor, 1823-1848. 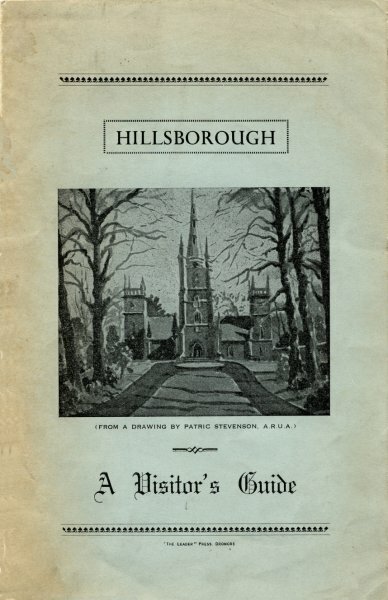 His brother, Robert Mullins, and his son, Walter Bishop, were successively Rector of Hillsborough within that period, and it was here that he wrote his well-known hymn, "Round the Lord in Glory Seated. 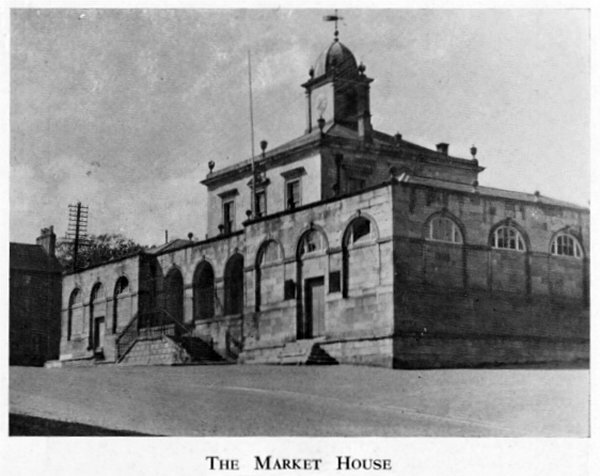 "THE SEXTON'S HOUSE and PARISH ROOM, at the entrance gates, were originally girls and boys schools respectively. They were built in 1773.
the right is the Government Research Farm. Once upon a time, before the lake was formed, the Hills had a house about a mile from the Fort, and connected to it by a tree-lined avenue. All trace of this house has now disappeared. The Fort is now preserved by the Government as an Ancient Monument. Formerly known as "The Castle," the building was begun by Wills Hill, First Marquis of Downshire, and completed according to his plan in 1796, four years after his death. The architect was Brettingham. Later additions were made, notably by the Third Marquis, in 1843. Originally the present drawing-room portico was the main entrance, and opened unto the Moira Road, which then ran close to the house. The present Moira Road was laid down in 1826, and the intervening parcel of ground enclosed in 1841. This explains the presence of an old QUAKER BURIAL GROUND within the precincts to-day. The Castle has been the official residence of the Governor of Northern Ireland since 1922. Wills Hill also built the Georgian houses of the village and the MARKET HOUSE, which is now being preserved by the Government of Northern Ireland. 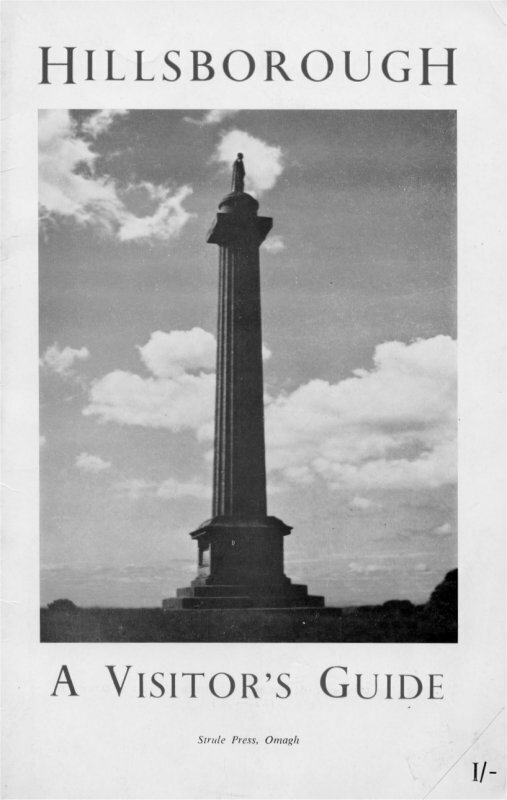 Two other striking features of the local scene are THE BRONZE STATUE of the Fourth Marquis (1812-1868), who was popularly known as "The Big Marquis," which stands opposite the Church gate; and THE MONUMENT-a lofty column on the hill on the Dromore side of the village, erected as a memorial to the Third Marquis (1788-1845). He died in Blessington, County Wicklow, and the return of his remains to the family vault in Hillsborough resulted in what was said to be the longest funeral procession ever seen in Ireland. 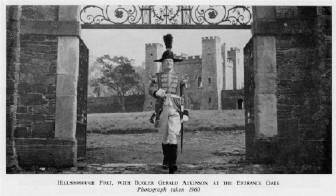 The present head of the family is Arthur Wills Percy Wellington Blundell Trumbull Sandys Hill, Seventh Marquis of Downshire. 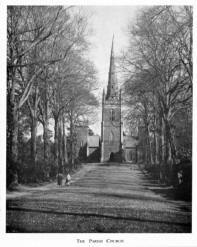 The Church stands some distance from the road on the left as one enters the village from Lisburn. 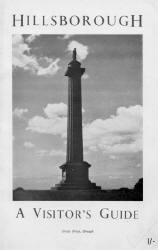 It was built by public subscription, aided by "a handsome donation" from the Third Marquis of Downshire, who also gave the site, and opened for worship on 29th December, 1833. Rebuilding and improvement took place in 1885. It is a pleasant rectangular structure in the Presbyterian tradition, and holds the loyalty of a flourishing community. 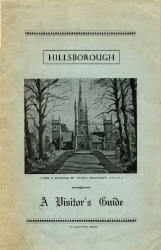 This leaflet has been produced for the convenience of visitors by the Select Vestry of Hillsborough Parish Church. Contributions towards repair and maintenance of the building will be thankfully received.